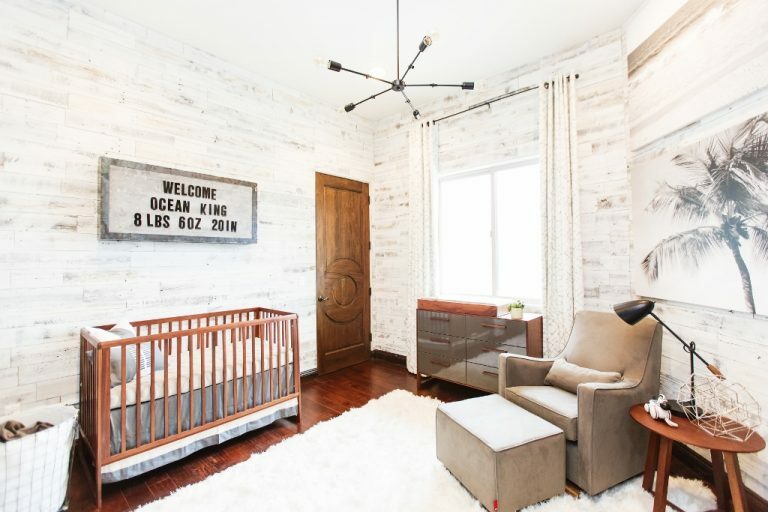 As you’re readying your baby’s space with the essentials—a crib, changing table and/or dresser, and somewhere to sit and rock your bundle to sleep—don’t forget this last nursery necessity: considered lighting. Here’s how to create a cozy and functional space where you and your baby can thrive. Start with overhead lighting. Your main light source should be bright, but not too harsh so as not to overstimulate baby’s developing eyes. Consider a fixture that filters the light to create softness or interesting shadows on the wall and ceiling. This is also a great place to make a fun statement with eye-catching ceiling lights, like the Ellis Adjustable Arm Chandelier above, or pendants and flush mounts. Take into account the size of your space when choosing the scale of your ceiling fixture—it’s all about balance! Add in task lighting. 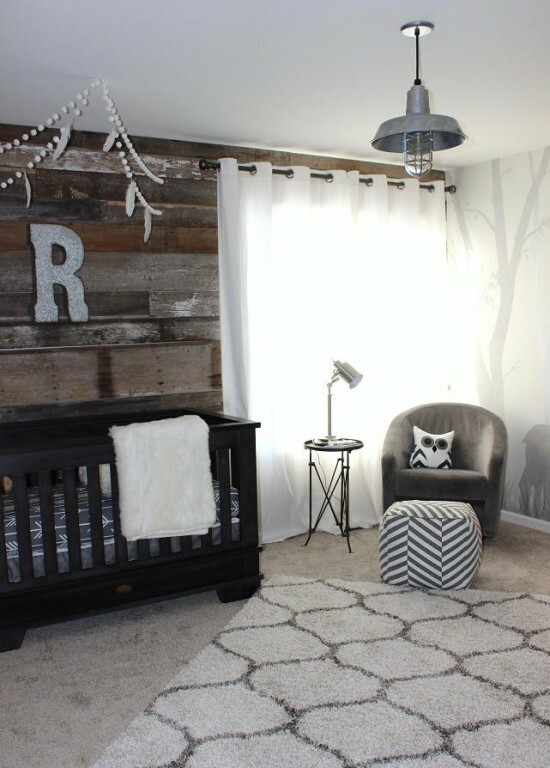 The nursery is more than just a place for baby to sleep. You’ll also be changing diapers and clothes, feeding, playing, reading, and bonding with your little one here. 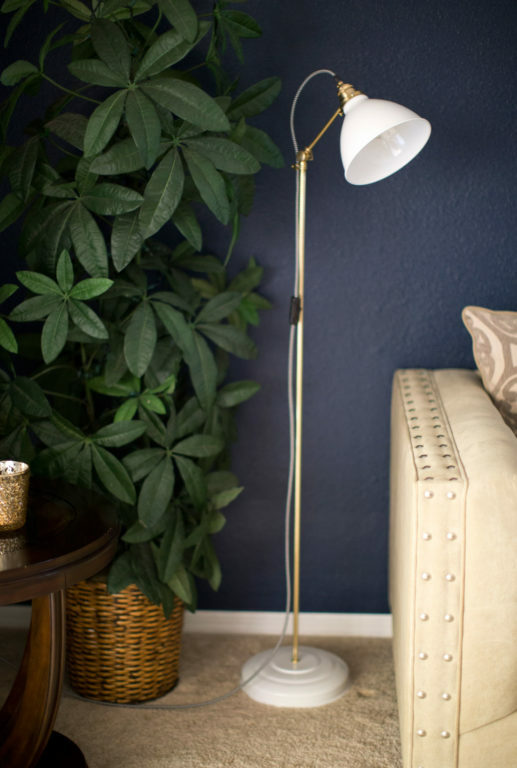 Light accordingly by placing table lamps next to changing stations, task lights or floor lamps near reading areas and your rocking chair, and sconces and other wall fixtures in nooks and crannies. SAFETY NOTE: Floor lamps are fine when baby is small, but you may want to remove them or place them out of reach once your little one begins to crawl and explore. Create ambiance. 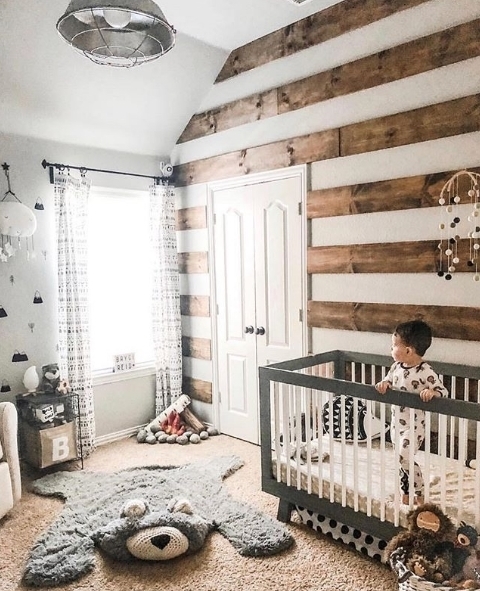 String lights, sconces, and small pendants provide cozy lighting and calming spaces for baby, create pockets of light for activities, and offer low lighting that’s perfect for late feeding sessions or diaper changes. Sconces and wall fixtures, like the Lovell Porcelain Plug-In Wall Sconces above, have the added benefit of hidden-away cords and wiring that are safely out of baby’s reach. Avoid halogens and exposed bulbs, which can be harsh for a baby’s eyes. Instead, use bulbs labeled as “soft light” or “daylight” to provide gentle illumination. Edison bulbs, such as the one above in the Original™ Warehouse Pendant with the guard-and-glass option, offer a soft glow. Install a dimmer to help baby wind down at night, as well as gently light your way for middle-of-the-night visits and check-ins. Similarly, be careful about heat that some bulbs can produce. CFL or LED bulbs are cool to the touch, so use for these for fixtures that baby can reach. Bonus: These types of bulbs are also more energy efficient! 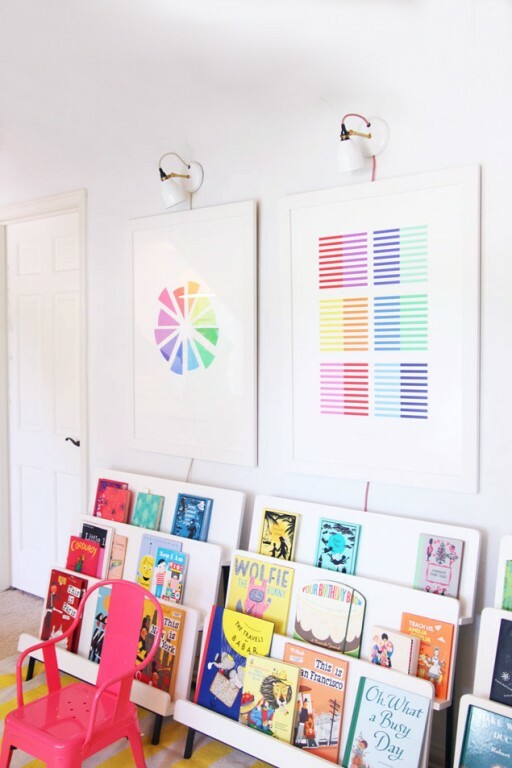 Layer your lighting. Aim for at least three points of light in your nursery, such as an overhead fixture, a table lamp, and a small reading light. SAFETY NOTE: With any plug-in lighting, make sure cords are safely out of reach and nowhere near the crib. Consider a ceiling fan/light combo or another kind of fan in the nursery. Good air circulation helps regulate baby’s body temperature and studies have shown that it can reduce the risk of SIDS by more than 70%. Control natural light. Natural light is great for baby’s developing vision, but can also interfere with daytime naps. Make sure you have window treatments that let you control when and how much light gets into the nursery. Think outside the children’s section. 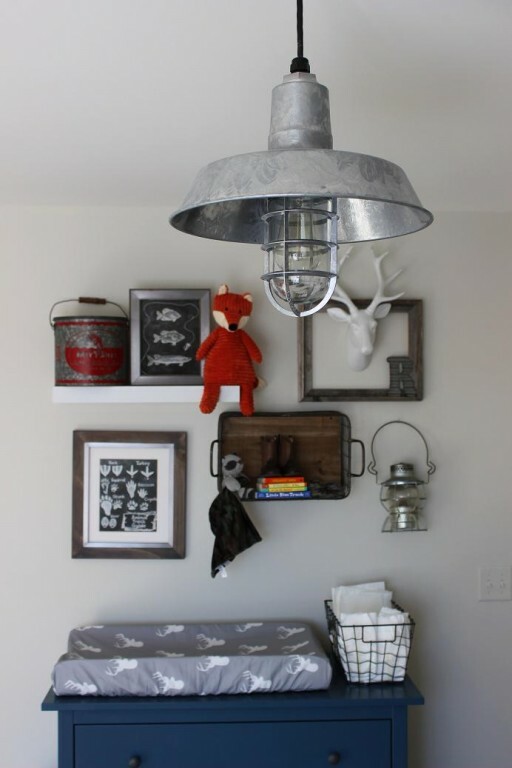 Beautiful, timeless lighting that isn’t made specifically for kids is a great way to create a stylish space that will grow with your child and last well beyond their babyhood. 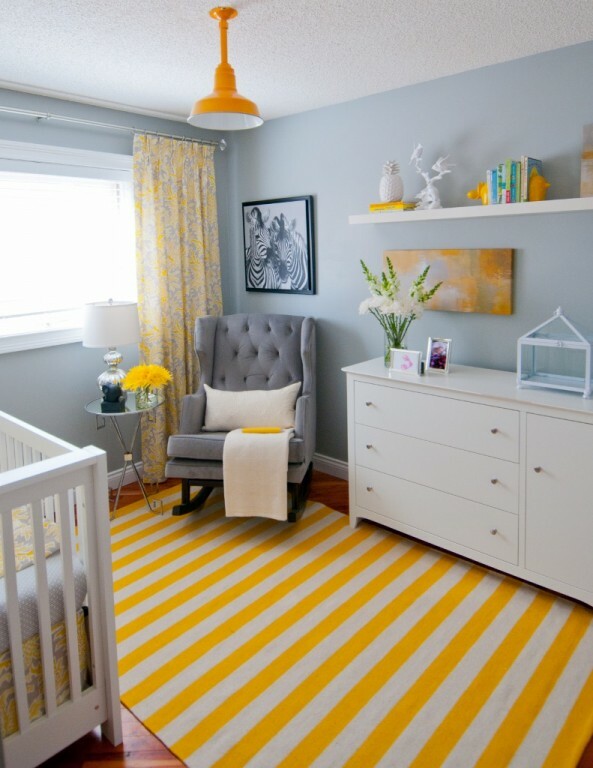 The playful pops of yellow in this beautiful nursery balance the modern, sophisticated look of the grey and white palette. Be sure to light your path to the baby for all those late feedings or soothing a crying baby in the middle of the night. Sconces, wall fixtures, and lamps strategically placed between your bedroom and the nursery are an ideal way to provide a low light that won’t be too harsh to sleepy eyes that haven’t quite adjusted yet. Don’t forget a night light! Some babies find comfort in the warm glow night lights provide, and they also come in handy when visiting your little one in the dark.